HomePoliticsElizabeth Warren Formally Announces 2020 Presidential Bid in Lawrence, Mass. February 9, 2019 Politics Comments Off on Elizabeth Warren Formally Announces 2020 Presidential Bid in Lawrence, Mass. LAWRENCE, Mass. 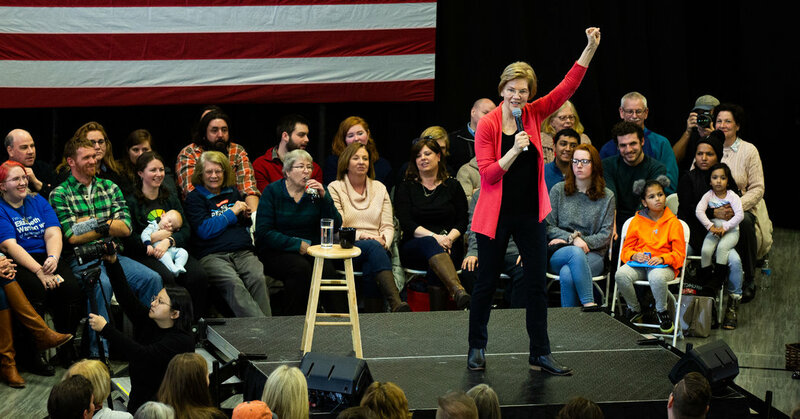 — Senator Elizabeth Warren of Massachusetts formally announced that she was running for president on Saturday at a rally in this former mill town. She was expected to travel later in the day to New Hampshire, before heading to Iowa and four other states. The selection of Lawrence was symbolic: It was the site, in 1912, of one of the most famous labor strikes in American history, started by a group of women at Everett Mill, where Ms. Warren made her announcement. Ms. Warren drew on the story of the strike as an example of women, many of them immigrants, taking on a system that was heavily stacked against them and triumphing, gaining raises, overtime, and other benefits. She described the American economy today as similarly tilted against the middle class, with government catering to the wealthy donors who fund political campaigns. Ms. Warren described how she rose from a childhood as the daughter of a janitor to become a law professor and a senator. That breadth of opportunity, she argued, had diminished in recent decades, as wealth had become more concentrated at the top and the government was controlled by rich donors. As a law professor, she said, she had studied what happened to families who were economically struggling. “I will fight my heart out so that every kid in America can have the same opportunity I had — a fighting chance to build something real,” she said. Ms. Warren also received two important endorsements on Saturday, from the Progressive Change Campaign Committee, and from Representative Joseph P. Kennedy III of Massachusetts, who introduced her Saturday. In practical terms, Ms. Warren entered the presidential race over a month ago and has campaigned in Iowa, New Hampshire, South Carolina and Puerto Rico since then. But as the Democratic field becomes increasingly crowded, the event in Lawrence was seen as a way to draw a fresh burst of attention to her candidacy. Ms. Warren also stepped afoul of some Democrats last year when she took a DNA test to prove Native ancestry, which angered some social justice activists and Native American leaders who felt that she conflated tribal blood with citizenship. Ms. Warren apologized to the Cherokee Nation last week, after months of resisting her own advisers and staff, some of whom had called for her to show contrition earlier. Democratic voters at Ms. Warren’s early campaign stops have repeatedly said the issue was not important to them, but it continues to be discussed. Some activists within the party seem to have been satisfied by Ms. Warren’s apology. Asked about the issue on Thursday, Alexandria Ocasio-Cortez, the freshman congresswoman from New York who is seen as a leader of the leftist movement within the party, said on MSNBC that it had not shaken her confidence in Ms. Warren and that Ms. Warren still had time to talk about the difference between recounting her personal history and claiming an identity. “I look forward to her modeling a public learning process and uplifting those voices,” Ms. Ocasio-Cortez said. Joel Benenson, who was the chief pollster for former President Barack Obama’s 2008 and 2012 campaigns and the chief strategist for Hillary Clinton’s 2016 campaign, said he would be surprised if the issue still lingered by the time votes are cast next year. But he said that she needed to find a way to address it forthrightly and give voters who have made a judgment about it a chance to reconsider. “She’s probably got to find something between now and then, at least within the Democratic field, to lay it to rest,” he said. October 17, 2018 Comments Off on What Will Meghan Markle and Prince Harry Name Their Royal Baby?